DPC56 rear calipers are engineered as a high performance street and custom replacement for Corvettes and hot rods using Corvette suspension. DPC56 calipers add high-tech styling and provide the positive response and balanced pad loading provided by a fixed mount, four piston caliper. The DPC56 is a direct bolt-on replacement for the OE calipers on all models of the C5 from 1997 to 2004, and all base model C6’s from 2005 to 2013 using 12.00” diameter rear rotors. The calipers attach directly to the Corvette spindle without the need for brackets or adapters and accept all types of OE banjo bolt style brake hoses. Using modern computer modeling and design technology, the DPC56 is based on the top performing DynaPro low profile caliper series. These calipers feature an ultra-high strength forged aluminum body, stainless steel pistons, internal piston damping springs, internal bore seals, stainless steel bridge wear plates, and a single screw bleed system. All DPC56 calipers accept the same type 4812 12mm thick brake pads as used in all low profile DynaPro series calipers. The piston volume of the DPC56 is matched to the piston volume found in the OE calipers. This makes it fully compatible with the output of the OE master cylinder and the ABS system. Front to rear brake bias and pedal travel remain as stock. 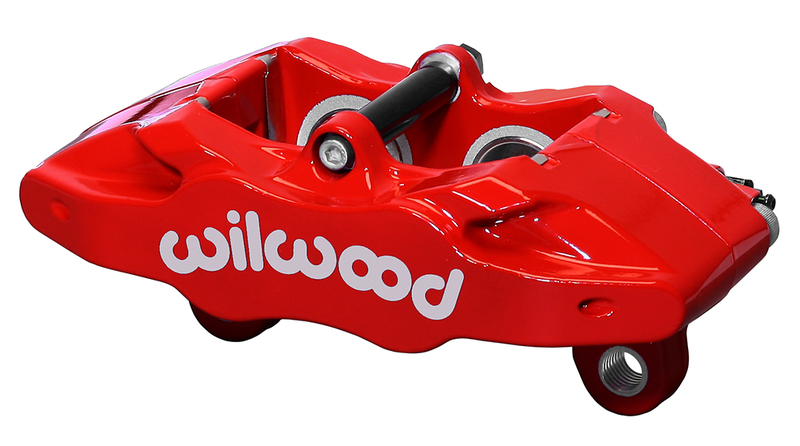 For custom hot rod builds, this caliper volume is also easily matched to other styles of manual or power brake pedals with proper master cylinder sizing. DPC56 calipers are externally finished with a high gloss red or black protective powder coating process that is both brake fluid and heat resistant. Internally, all surfaces and passages are anodized to provide additional corrosion resistance with a durable wear surface for stainless pistons inside. DPC56 calipers will maintain their stylish good looks and rugged durability for many miles to come. NOTE: DPC56 caliper kits have been checked to clear Z06 model wheels. All other OE production and aftermarket wheels should be checked for proper clearance prior to installation. Wheel spacers may be required on some applications. Please refer to the wheel clearance diagram for additional information on backdrop spacing and radial clearance requirements.